Managing a fraternity house is hard enough without thinking about costs. Brothers--well, you love them, but they are shall we say “challenging” tenants at times. Inspecting the property each semester can be an adventure, to put it mildly. When you discuss the facilities with brothers, sometimes the things that come out of their mouths surprise you, and you thought you’d heard it all. But you face the challenges together, and you get through them together. Yet your role with the housing corporation requires you to tackle more than unidentifiable stains, weird smells and toilets broken in unspeakable ways (seriously, guys? How? Why?). House finances sit atop your hefty to-do list. Complicating things further, you have to fluctuate between a financial management role and that of a chapter advisor. Many brothers are entering into their first official lease agreement and don’t have a clue what the financial reality of fraternity housing entails. And to be fair, that isn’t really their job. Above all else, they’re tasked with succeeding academically and growing as fraternity men. Brothers aren’t going to spend their weekends toiling over chapter house insurance premiums and property taxes when they should be preparing to ace that Organic Chemistry exam. Yet they still need to understand the legality of their lease agreements, utilities and the associated regulations of the university, national fraternity and/or the property lessor. So . . . as a housing corporation volunteer, how do you handle this monumental task? You really need to knock house management out of the park, or there can be major consequences for the chapter, members of the housing corporation and the national fraternity. Fraternity financial software can play an important role in ensuring success. That’s why OmegaFi wants to help you Bring Down the House with Fraternity House Financial Software. Brothers and alumni volunteers need to consistently be on the same page when it comes to fraternity housing matters. However, this is really just part of a larger effort to build more robust chapter-alumni communication and engagement in the long run. Chapters and their housing corporations can manage finances more efficiently by investing in comprehensive financial management software. Many chapters already use OmegaFi’s Vault to manage their day-to-day chapter finances and membership dues collection process. Vault Pro by OmegaFi offers expanded services and the professional account management of an on-staff, dedicated financial expert, which makes it the perfect solution to centralize chapter and housing corporation budget and billing management. In addition to functionality with bill pay and account reconciliation oversight, monthly financial reporting and managing 1099 tax documents, Vault Pro software offers consulting on billing, budgeting and management of your housing corporation. Vault’s expanded features also include contract management, so you can collect electronic signatures for brothers’ lease agreements and manage leases and other financial contracts through this software. OmegaFi designs its software for the specific financial needs of fraternity chapters, national fraternities and housing corporation alumni. By using software to centralize chapter and fraternity house financial management, brothers and alumni can get on the same page and engage each other about finances in a more streamlined and dynamic way. Can Software Replace a Smart Fraternity Fundraising Campaign Strategy? A major fraternity capital campaign to remodel or purchase a new fraternity house entails stalwart engagement between the chapter and their alumni, clear and consistent communication about campaign goals, pre-campaign cost planning, an intricate understanding of trends in alumni giving and high-level management. Your best bet is to invest in fraternity communication tools to bolster these needs. Fundraising campaigns require both management from undergraduate brothers and oversight by alumni board members. However, when planning a major capital campaign, utilizing financial software and consulting with experts can make preparation for managing the property much easier. Once you determine the appropriate rates to charge undergraduates living in the house, what the taxes and insurance will cost and so on, it becomes much easier to draw up the leasing paperwork and plug the appropriate numbers into Vault. Monthly reporting also becomes a crucial tool during this transitional period managing the finances of a new or altered property. You can seek feedback on trends and statistics from OmegaFi experts and adjust your financial planning accordingly. A fundraising campaign this large typically has more to do with proper communication and engagement than with software. Yet with a robust plan in place and strong execution, fraternity financial software can help ease the transition when you complete a house-related project. A fraternity house isn’t just a building you manage. Tens of brothers call it home each semester. Hundreds will have stepped through the doors during the lifetime of your house. Brothers grow and learn and become stronger men between those walls. It’s easy to forget that when you’re mired between ledger lines, pulling out your hair over the zeroes during tax season. Software seems like a tempting solution to fill this void when you’re overwhelmed, but no mobile app will ever replace the human touch when it comes to fraternity house management. For local alumni, actually visiting the fraternity house a few times between inspections can give you a stronger connection to the brothers living in it. If the university owns the house and covers things like inspections and maintaining safety equipment, these periodic get-togethers become all the more important. Get a feel for how brothers manage the house, as well as their strengths and weaknesses when it comes to house finances. Advise them when necessary. In some ways this can help you anticipate and avoid future hurdles, and will strengthen crucial chapter-alumni relationships. Couple this with communication tools and financial management software, and your fraternity house will thrive for years to come. 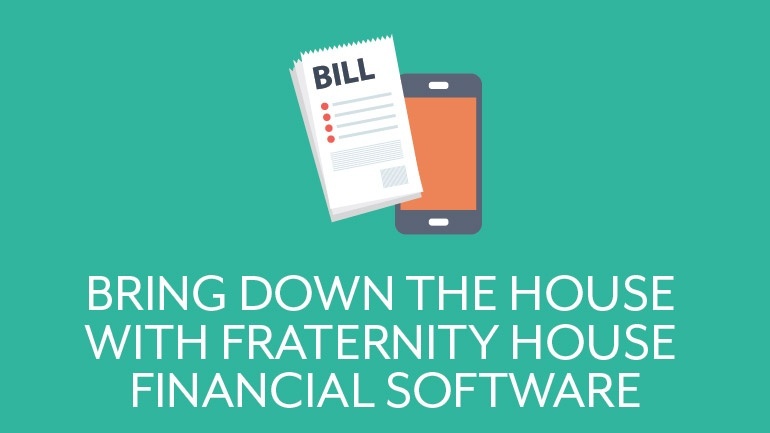 Are you currently using software to manage fraternity house finances? If so, what do you like about it and what can be improved? What other tools do you use for your fraternity housing needs? Give us the sum of things in the comments below.